Diet trends come and go. You can’t miss them on the front pages of grocery store magazines and Google. You may have seen the story of a Massachusetts doctor that shed an impressive 125 pounds over the course of 18 months. Dr. Kevin Gendreau had life-changing results and attributes his success to the 16:8 intermittent fasting diet. The 16:8 diet is a time-restricted fast that requires participants to fast for 16 hours a day, but then feed on whole foods the remainder of the time. It is always important to consult a doctor before starting any intermittent fasting regime. It is especially true for individuals with diabetes and is ill-advised for expecting mothers or women that are planning on getting pregnant. Keep in mind that there are other intermittent fasting plans that don’t limit you as much as the 16:8, and may be easier on your body type and fitness level. Another success story was the case of beauty influencer Janelle Wright, who lost an awe-inspiring 65 pounds in 6 months. These success stories are growing in numbers, which has other hopefuls adopting intermittent fasting as the holy grail of diets. Americans are obsessed with diet and exercise crazes. And why wouldn’t they be? Many of us are at least “overfat,” and there is nothing wrong with wanting to look and feel better or have a flatter tummy or firmer biceps. Only trouble is, the vast majority of people refuse to grasp the reality that these trends may not be good for their health. Not all diets or exercise routines are created equal. There is no magic pill or ten-minute workout that will transform you overnight. A healthy and balanced physique takes time and an acute understanding of what your individual body needs. Your body and biology is entirely unique. While a plant-based diet or circuit training may work wonderfully for the person on the treadmill next to you, it doesn’t mean that it is what’s best for your genetic makeup or build. Personal biology aside, women and men should have slightly different diets and fitness routines. It goes without saying that men are hormonally different from women, and are genetically keyed to respond differently to certain exercises and nutritional plans. Different ritualistic styles of fasting have been practiced for millennia. Both Gautama Buddha, Pythagoras and Confucius were hip to fasting. It is rarely known that they were all contemporaries, and it is even rumored that Pythagoras traveled a great distance to meet with Buddha. Imagine that swapping of wisdoms. They all lived long lives, with Buddha passing at around 80 years of age. That is quite the feat of longevity considering life expectancy in 400 B.C. was 35. So what did these wise men understand about fasting that made them embrace it as a discipline? Whether you subscribe to fasting for the sake of weight loss, religious or meditative purposes, fasting is a practice that has merit. But how beneficial is this new-age spin on fasting for our long-term health? Let’s begin with the more promising and less confusing benefits of intermittent fasting (IF). Studies are rolling out new findings on intermittent fasting daily because of its popularity. The great news is, most of it is positive. Basically, the act of fasting temporarily rewires your body to pull energy from stored fat supplies, rather than what is readily available in your stomach or gut. Hibernation could be considered an act of fasting, but in this instance the participant is active and awake. Hibernating mammals survive almost entirely on stored fat supplies while they hunker down for long periods of time. Several things take place when you fast. Intermittent fasting modifies the function of cells, genes and hormones. Your body, being the cleverly crafted enigma that it is, signals for a cellular repair response and begins changing hormone levels to make stored fat more accessible. That is another reason why women should be cautious of intermittent fasting. Hormone levels change dramatically during fasting. This may not be ideal for some female candidates, depending on age and overall fitness level. Certainly not recommended for expecting moms. You can count on a few things happening when you are intermittently fasting. Insulin levels significantly drop. Which triggers the fat burning phase of fasting. When intermittently fasting, the human growth hormone kicks into overdrive and skyrockets to as much as 5 times its normal presence. This hormone promotes muscle gain as well as fat burning. Cellular repair might be one of the most astonishing occurrences to happen during intermittent fasting. Your body induces the cellular repair process and begins to actually remove waste material from cells. If cellular detoxification didn’t dazzle you, fasting also changes genes and molecules that are responsible for longevity and your body’s ability to fight off disease. Nowadays it seems that most foods are designed to work against us, even if we have the best intentions. Fast foods, processed ‘diet’ foods and sugary juice cleanses are all conspiring to confuse us and derail our minds from understanding what a healthy diet looks like. Simply put, we all should be eating more vegetables, fruits and nuts. Whole foods are at the very center of a balanced diet. Just because you’ve decided to pick up intermittent fasting as a way to drop extra weight, doesn’t mean that you should continue to eat high carbohydrate meals or overdo it on the refined grains when you are eating. Always steer clear of processed sugar like energy drinks and sodas. Swap them all out with water. Water is your friend. Fasting does sound rather extreme if you’ve never tried it before, but there could be an easier approach. 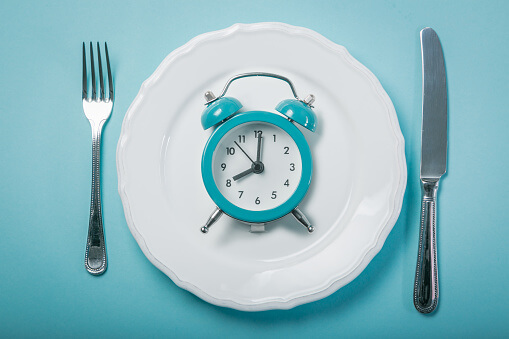 How do you get the benefits of intermittent fasting without the strict regimented guidelines? Well to start, don’t eat late into the night. This is an avoidable bad habit. Fasting doesn’t have to be a labor intensive drag. It really boils down to using your better judgement and applying a little discipline to your routine. Consider the times of the day you are most active and eat within that time frame. Eat whole fruits, vegetables and grains during the times you are not fasting. Drink plenty of water, and you may even want to take short walks after meals. Set a time to stop eating in the early evening and stick to it! If you are most active between the hours of 7AM-5PM, whittle out a block of time before 5PM to get all your nutrients in and adhere to that timeline. It is best to space your meals out and not have your full calorie allowance in one sitting. All signs mostly point to intermittent fasting being a productive way to rewire the body to burn fat in a different way. Find a version of fasting that works for you, your body and schedule. There is no point in starting a fasting routine if you are unable to practically accomplish it. Many of us are searching Google for information on intermittent fasting for the sake of weight loss. But it is extremely important to be acutely aware of your body, your goals and how the strain of fasting will impact your overall health. With all of these astonishing biological occurrences flitting about, it is easy to get overly sold on the idea of intermittent fasting to drop some winter weight. It is important to reiterate one glaring truth. Intermittent fasting isn’t a foolproof science. It affects everyone differently, and the long term research hasn’t yet surfaced to concretely say that fasting is beneficial or detrimental to the modern human body. Some medical professionals warn against the strain fasting has on the heart and other organs. While there have been studies, we are still existing in that gray area. One of the pitfalls that most people tend to overlook when beginning intermittent fasting is overeating during the feeding cycle. This varies for everyone though. Just because you fasted earlier, doesn’t mean you go heavy on the sauce, so to speak. The purpose of intermittent fasting is to trigger biological shifts in the body and to burn fat reserves. By over consuming during times when you aren’t fasting, you are putting added strain on your system and defeating the purpose of fasting in the first place. Women should be especially cautious when engaging in intermittent fasting. Because of the significant fluctuations in hormone levels, some women have complained of missed periods, moodiness and even early onset menopause. Hormones that are regulating important functions like ovulation are hypersensitive to energy intake. To be on the safe side, contact a qualified healthcare professional before moving forward with any drastic weight loss regime. For the time being it looks as if intermittent fasting is here to stay. And it does work wonderfully in the short-term for many people. Just remember to be aware of any negative shifts in mood, sleep patterns, fatigue and don’t overeat during times when you aren’t fasting. If you stay vigilant and follow a well-balanced diet when you do eat, you should be well on your way to enjoying some mental clarity while also cleansing your body of unneeded fat. To avoid nutrient deficiencies, remember to eat a plentiful variety of nutrient rich foods and don’t load up on carbs. If you are unsure of what types of nutrients you need more of and which ones you should limit, you can easily take a nutrient test to better understand the wants and needs of your body.